Radar is a compact side table with a big personality. Both playful and striking, with clean asymmetrical lines and a bold silhouette. Radar functions as a prominent platform for both storage and display, but can also act as a stand-alone, iconic statement piece. The practical built-in shelf is perfect for storing your magazines and laptop next to the sofa or holding your favorite book beside the bed. The small slot in the back of the table top creates a cleeve for your phone charger, so you won't have to fumble aroyund for your cord on the floor every night. 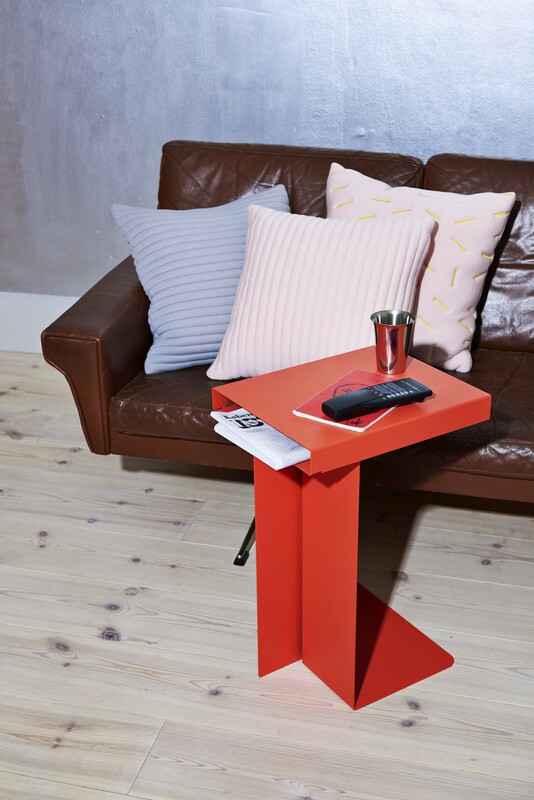 The asymmetrical design makes the side table efficient for breakfast in bed, as it can be dragged over the bed or even over the sofa if you are working on your laptop in the evening. The table is laser cut and bent from only two pieces of steel, giving it a graphical framework that will create edge to any interior. Radar is designed from a fascination with surface and cultivation og the industrial production.